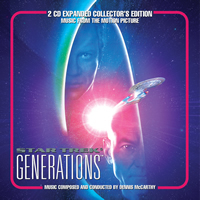 STAR TREK GENERATIONS - 2CD Collectors Edition Soundtrack by Dennis McCarthy ¥ NOTE: All autographed copies are now sold out. GNP Crescendo Records continues its commitment to Star TrekTM fans with the first-ever release of Dennis McCarthy’s complete score for Star Trek Generations (1994). This 2 CD collector’s edition features the complete film score on disc one (including music for one scene deleted from the finished film), and a remastered version of the 1994 GNP soundtrack album (and its innovative sound effects library) on disc two. Star Trek Generations was the first feature film starring the crew of Star Trek: The Next Generation, a “passing the baton” story in which Star Trek: The Original Series character James T. Kirk (William Shatner) teams up with Star Trek: The Next Generation Captain Jean-Luc Picard (Patrick Stewart) via a mysterious space/time phenomenon called the Nexus to battle an obsessed alien scientist, Dr. Soran (Malcolm McDowell). Generations’ atypical (for Star Trek) mood of melancholy, contemplation and—ultimately—uplift was captured by the composer who has scored more hours of the modern-day Star Trek television series than any other, Dennis McCarthy. Relishing the opportunity to work with a large orchestra and a more cinematic vocabulary, McCarthy used a broader, more melodic palette befitting the big-screen presentation. From its innovatively gentle main title music to its traditionally heroic themes, from its haunting choir-infused music for the Nexus to its strategically spotted quotes of Alexander Courage’s Star Trek fanfare, McCarthy’s score both honors tradition and brings a fresh new voice to the Star Trek universe. GNP Crescendo released the original soundtrack album to Star Trek Generations in 1994, featuring 45 minutes of score highlights. This expanded release includes not only the full score (nearly 76 minutes) and remastered album, but also 3 bonus tracks—including the motion picture dialogue “Lifeforms” performed and somewhat improvised by Brent Spiner (as Data). The accompanying 16-page booklet includes informative notes by Jeff Bond and Lukas Kendall and is lavishly illustrated with film stills. A track-by-track commentary for both discs by John Takis is available online at gnpcrescendo.com/generations. All autographed copies are now sold out.